I was expecting some strenuous but constructive criticism from the sceptical community about my Fallacy Fork article, and I have not been disappointed. Skeptical Inquirer published a selection of four letters from readers, and Steven Novella has criticized my article on his blog and podcast. Readers have taken issue with both of my central claims: that cut-and-dried fallacies rarely occur in real life, and that fallacy labels are often casually thrown around in a way that distracts from the substance of a discussion. My first argument has been met mostly with incredulity. Steven Novella writes that I “need to get out more” and advised me to “spend some time in the trenches” with active sceptics. Other readers write about “abundant evidence” for fallacies, plentiful “applications to real life” and “2,300 years of effective use”. But apparently fallacies are so ubiquitous in real life that readers didn’t even bother to offer examples in their replies! Robert Clear just directs me to some “online-comments sections of articles on contentious topics”, and he just states that global warming deniers often use ad hominem and ad verecundiam fallacies. Novella similarly writes that I need to “sample the comments to this blog”. Don Yost mentions the presumed causal link between asbestos and cancer in a list of examples of the post hoc “fallacy”, but without giving citations. I think some sceptics would beg to differ. What if someone included, say, the link between tobacco and cancer in such a list, or between CO2 and global warming? In order to see which causal arguments are plausible and which less so, throwing around fallacy labels is pretty useless. I would really invite readers to take some specific real-life arguments from pseudoscientists, and see if they can find clear-cut post hoc fallacies. Bear in mind that all of us rely on post hoc reasoning in everyday life, as I pointed out in my article. As we documented in our paper, you’ll find a range of weak, truncated, questionable and sloppy post hoc arguments, but you’ll find few people who flatly say that A must B have caused B merely because B followed A. Or, as one reader defined the fallacy: “If B follows A, then this proves that A caused B”. But even your average homeopath is not that silly. It’s not a coincidence that even Carl Sagan, when introducing his Baloney Detection Kit, resorts to toy examples of fallacies rather than real-life ones. As for my second claim about the careless use of fallacy labels as a substitute for genuine arguments, Gregory S. Bucher agrees with me, but David Clark writes that I “completely misrepresent” the practice. According to him, it’s not a matter at all of “uttering a phrase from a list of phrases”. But ironically, the letters illustrate my point better than I could’ve. Few readers could resist the temptation to accuse me of having committed this or that fallacy in my article, perhaps the better to show my inadequate understanding of fallacy theory. My article has been variously charged with the Straw Man Fallacy, the “fallacy of false alternatives”, the “fallacy of incomplete evidence”, and the fallacy of the false continuum. And all crammed in one article! Does this use of fallacy labels move the debate forward? Hardly. When Michael Mauser suggests that my Fallacy Fork is an instance of the fallacy of “false dichotomy”, he doesn’t go on to explain why this is so. It’s almost as if the label suffices. But some dilemmas really exclude their middles, just as some slopes are really slippery, and some correlations point to genuine causal links. Or take Novella’s charge of a “false continuum”. According to Novella, I have seen twilight and concluded that night and day do not exist. But Novella misrepresents our argument, which is not about grey zones per se, but about the descriptive validity of the concept of "fallacy". To stick with the metaphor: we do indeed have a crisp conception of “night” (i.e. our textbook definitions of fallacies), but when we go out in the real world, we see only (or mostly) the twilight of nuances, complications, contexts, qualifications and uncertainties. In our paper, we contrast this with the term “pseudoscience”, of which I happen to be a big fan. Sure, there are grey areas between good science and pseudoscience (e.g. string theory), but at least we can point to plenty of fully-fledged pseudosciences in the real world (homeopathy, astrology, creationism…). My claim is that this is a lot more difficult with the concept of “fallacy”. In playing “fallacy gotcha” with my article, I think readers have inadvertently shown what’s wrong with fallacy theory. But let me end on a positive note: I fully support the goals and philosophy of the sceptical movement, and I have indeed spent years “in the trenches” with the Belgian sceptics. It is exactly during my “service” in our trench warfare against baloney that I came to realize that some of the weaponry on our side was not as sharp and accurate as I would have wished. Post hoc (a shortened form of post hoc, ergo propter hoc) is a fallacy in which one event is said to be the cause of a later event simply because it occurred earlier. Donald Trump/ Supporters The russia investigation was triggered by a fake dossier sponsored by hillary clinton. President Trump fired the F.B.I. director, James B. Comey, citing his handling of the investigation into Mrs. Clinton’s use of a private email server. The Justice Department appointed Mr. Mueller, the former F.B.I. director, to serve as special counsel and oversee the investigation into Russian interference in the 2016 presidential election, including any contacts between Mr. Trump’s campaign and Russian officials. I'm 13 months late to the party, but thanks for the follow-up! To further your point, I would add that even if one rejects the idea that "some cut-and-dried fallacies rarely occur in real life", the act of pointing them out usually would not move the debate forward. Most of the time, either the person argues in bad faith or does not really try to have an interesting debate (to make such a patently bad argument) or they really don't see how bad their argument is, so simply pointing it out won't help them understanding how they are wrong. 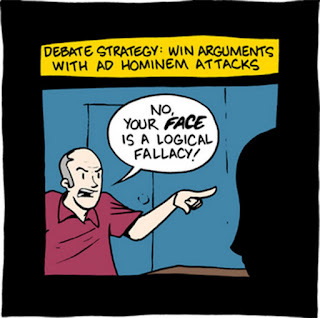 As a skeptic, you have two choice : either you assume the good faith of the person you argue with (or know it to be tre) and explain how the argument is bad to sincerely help the person understand their mistakes, or you assume (or know) that this debate won't be intellectually productive and act accordingly (maybe by ridiculing the opposition, refusing to engage, or something else that is appropriate for your aims). In this second instance, maybe simply crying "fallacy" can be useful, but it's your aim is specifically not to debate the substance of the discussion, but to accomplish some other goal. The sad reality nowadays seems to be that for the vast majority of online discussion which contains blatant logical fallacies, it has become nearly impossible to discern mere lack of knowledge or insight from downright intellectual dishonesty. That is: 90% of posts that look like they warrant a reaction, turn out to be just deception. Maybe even in particular the ones that are worded in such a way that they sound like written by a reasonable person. Or in other words: unless you want to be constantly disheartened and demoralized, it helps to understand that you're very unlikely to "reach" the person you're replying to. The rest of the audience - the mere READERS - are the ones you're trying to reach. THEY are the ones that need to be pointed towards fallacious arguments and rethorical techniques. Don't worry about the original posters.